Ald. Maureen Morrow at a section of broken railings at Coast Road. Ulster Unionist councillor for Larne Coast Road Ald. 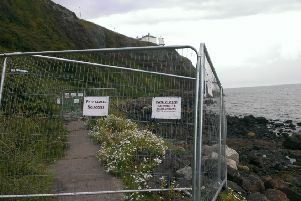 Maureen Morrow has called for investment in a “maintenance regime” for railings along the Antrim coastal route from “Carnlough to Carrickfergus”. In a statement, Ald. Morrow said: “It’s not just about how the railings look along parts of the iconic Coast Road- a premier tourist attraction for our borough. “It is the road safety aspect of the corroding and - in places- missing railings. 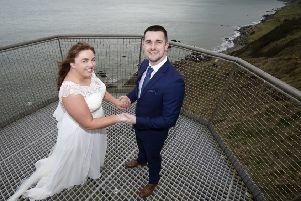 “Apart from the section along Larne promenade, the ownership and responsibility for the upkeep of the railings lies with the Roads Service - part of the Department for Infrastructure. “For many months I have been encouraging DfI to commit to fixing the broken railings and then reinstating a regular maintenance regime to treat and paint the railings to stop further deterioration. If this doesn’t happen, more railings will simply rust away and fall into the sea. “At present, DfI staff are assessing the situation to providing costings for a new budget to address the railing issue from Carnlough to Carrickfergus. “There is no doubt that the maintenance regime all along the Coast Road has been allowed to slip due to tightening budgets. The fact is that the rusting effect of the salt air and the severe storms which have battered this coast over the last few years is really starting to show on the railings.